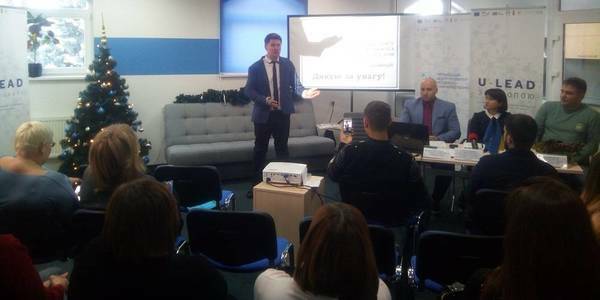 The Cherkasy Local Government Development Centre held a press conference, where the preparation of the Development Strategy of the Cherkasy Oblast by 2027, with account of SMART-specialisation, was announced. According to Serhii Slynko, Director of the Cherkasy LGDC, established with the support of the U-LEAD with Europe Programme and MinRegion, the Cherkasy Oblast became one of the first in Ukraine to join elaboration of a Development Strategy on the principles of smart-specialisation. Today it is one of the three Ukrainian oblasts on the EU map of such strategies’ elaboration (http://s3platform.jrc.ec.europa.eu/). The Cherkasy Oblast is currently starting to prepare, in fact, its most important document to be followed by it in the coming years. And it is extremely important that the development strategies of amalgamated hromadas will be synchronised with the general development strategy of the Cherkasy Oblast.